When I found out I was going on my very first cruise aboard Disney Cruise Line, I must admit I was a little intimidated. Not because of the travel planning part of it. I’ve got that down, for obvious reasons. Rather, I was intimidated by a longstanding DCL super crafty tradition: the fish extender gift exchange. I’m not completely craft impaired, but I’m not exactly a creative pro (see my Easy DIY Disney Cruise Door Decorations as evidence). There are no Cricut machines in this household or anyone who can remotely operate a sewing machine. I wanted for my kids to have the fun of our family participating in this tradition. But could I do it justice among legions of super-crafty Disney fans? I decided to commit myself to showing other future DCL cruisers that you can do fish extenders even if you don’t have a creative bone in your body. Here’s how I did my very own fish extenders for the “dummies” among us! What the Heck is a Fish Extender? First things first… many of you are probably asking what on earth a fish extender is! It’s a tradition specific to Disney Cruise Line. There’s a small fish-shaped book outside every cabin door on all the Disney ships. Guests began hanging bags from this hook and then dropping small gifts off to fellow cruisers to extend the Disney magic even more. Fish extender exchange groups are arranged in advance of your cruise. You can find them on either DisBoards or in a Facebook group for your cruise sailing. For my February cruise aboard the Disney Wonder for the Disney Social Media Moms Celebration, I found a group on Facebook. My group included 10 families for a total of 41 people. The goal is to leave gifts for everyone in the family (adults often get a joint gift). Since everyone – including you – has limited luggage space, particularly if you are flying in for the cruise, keep the size small is key. Fish extenders are essentially modified shoe or toiletry caddies hung outside your stateroom on a cruise. A lot cruisers sew their own custom fish extenders, adding Disney bling and customization. There are even a number of sellers on Etsy who specialize in making and sewing cute and functional ones for cruisers to buy. Four different varieties of fish extenders spotted on our cruise. Because my husband wasn’t going on this trip, I didn’t want to have a custom one made just yet for our family, so I decided to make our fish extender on the cheap and as easily as possible. Making the DIY duct tape fish extender. There is a very well-known and often-pinned blog post that shows how you can make a fish extender using duct tape, so I went to work. I bought two rolls of Disney themed duct tape at Michael’s, one roll of black duct tape, and grabbed a few Ziploc bags. For name plates, I found chalkboard wooden cutouts attached to clothespins ($1.50 for 2 at Michael’s) and used glitter letter stickers on them to write our names. The result – not bad, right? It totally survived the three day cruise and was the perfect size for holding every gift we received. The finished product – only duct tape and Ziploc bags required! With my fish extender made, it was time to get to work on the gifts I was going to give my fellow cruisers. Lots of people get very crafty with homemade Disney inspired gifts, but store-bought is completely acceptable too. I decided to do a little bit store bought with thoughtful and minor crafty touches. The kids ages in my group were all over the map so I tried for gifts that had a wide age range appeal. We also had several children with food allergies in our group, so non-food items were especially important in my hunt. Our gifts bagged and ready to be packed for our cruise! If you are going to do store bought or modified store bought, here are the best stores to find small trinkets and Disney-themed gifts on the cheap. The key to a successful fish extender gift is small size and small cost with a little wow factor. Here are some ideas that I bought and made to get your creative (even if not-very-crafty) juices flowing! Travel Sewing Kits. The Michael’s $1.50 display had a large number of travel sewing kits that are a practical gift for parents who love to travel. To make them a little Disney-themed, I added a set of Mickey ears with a black paint pin. Doable even if you don’t have a crafty bone in your body! Mini Pixar Lamps. When I spotted these white miniature book lamps in the flashlight section in Daiso, I about died. They look just like the famous Pixar lamp! I already had some small Pixar character stickers at home and just added them to the lamps for an extra Disney touch. Book lights with a Pixar touch. Ghirardelli Chocolate Squares. Plenty of people give fish extender gifts based on where they are from. Since I’m from the San Francisco area, I wanted to give away a taste of my home town. I bought a few bags of the Ghirardelli chocolate squares in the Target grocery section and divided them up between the parent gift bags. Little did I know that DCL room attendants also put Ghirardelli chocolate squares on beds at turndown, so I’m sure everyone had chocolate overload. Disney-Themed “Play Pack” Coloring Books. For Valentine’s Day, Target offered miniature Play Packs sold in bags of 8 for just $3. Great option for younger kids in your fish extender group! Disney-Themed Playing Cards. I grabbed sets of playing cards at a toy and calendar store for 50% off (just $2 each). Great gifts for both adults and kids. Disney Candy Trains. This might have been the most labor intensive of the gifts I made. But the only crafting supply needed is a hot glue gun along with several candy varieties. Making them is pretty paint-by-numbers so even non-crafty folks can make these happen. I added a variety of Disney-themed stickers to the front for a little extra fun. When our cruise came, it was so exciting to see the gifts that others created or bought. Here’s a sneak peek at some of the amazing thoughtfulness – from Baymax themed first aid kits to Disney character luggage tags to personalized water bottles and cups, our suitcases came home full of Disney magic and useful items too! Just a small fraction of the cute loot! Thanks to our group. 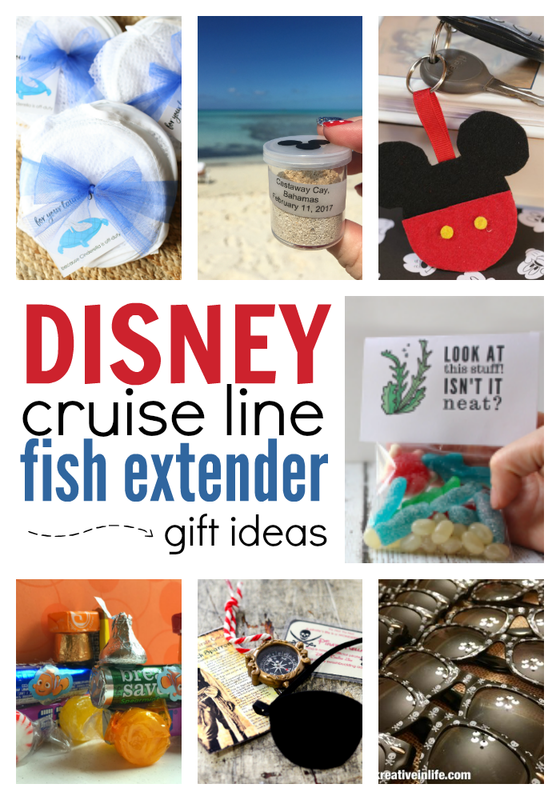 Since I was on this Disney Cruise with 160 attendees of the Disney Social Media Moms Celebration and their families, it goes without saying that a lot of fellow Disney-loving bloggers got in on the fish extender fun. Check out their ideas too (some of which are admittedly much craftier than mine!). 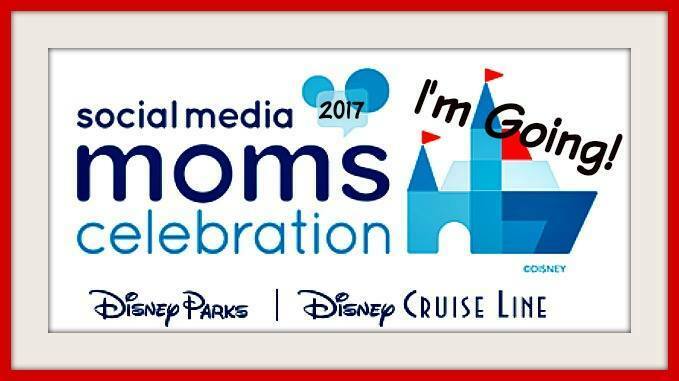 Disclosure: I was invited to attend the Disney Social Media Moms Land & Sea Celebration in 2017. Disney provided me and my family with discounted conference admission, tickets, and lodging. Disney and its conference sponsors also provided me with additional gifts during the event. As always, all opinions are 100% my own. This so interesting. The last time I went on a Disney Cruise I don’t think anyone was doing this. We are going next month and apparently we are doing this. Thanks for some good ideas.